Annie Sullivan grew up poor and abandoned, spending much of her childhood in the state poorhouse in Tewksbury, Massachusetts. 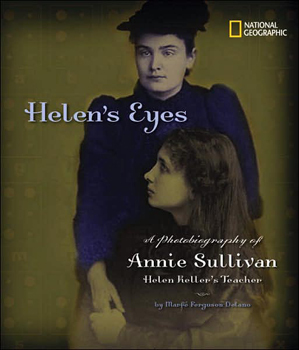 A raging thirst for education led her to the Perkins Institution for the Blind, where she was known as “Miss Spitfire.” After graduation, the need to earn a living led Annie to her blind and deaf pupil, Helen Keller. Annie’s breakthrough teaching methods uncovered a gifted girl who inspired a nation. Together, Annie and Helen made history. She was Helen’s eyes and Helen’s ears. She was Helen’s friend. But always to Helen, she was T-E-A-C-H-E-R.
Annie Sullivan shows us what teaching, at its best can do. Her gifts saved one little girl from darkness and made our own world so much brighter.